Enrichment Classes are supplemental classes (such as music, art, robotics, yoga, Spanish, science, etc.) that we offer our DCS students both on and off-site to enrich the school learning experience. Because DCS pays for these classes, these classes are either free for our students or there is a small cost per term (usually between $5-$20) which can be deducted from your allotment fund. These classes are taught by vetted community educators. Most Enrichment Classes are offered between 12:30-4:00, Mondays through Thursdays (with a very few outside of these hours). When can I see the schedule of Enrichment Classes for each term? We try to keep an ongoing “draft schedule” of upcoming enrichment classes for each term on the DCS Website. You will know that it is not the final schedule because it will say “DRAFT SCHEDULE – NOT YET FINALIZED” at the top. This means that any of the classes can change or be dropped and other classes may still be added at any time until the final schedule is released to families. Depending on the term, DCS families will receive an email with the actual, confirmed list of enrichment classes as soon as the schedule is finalized, usually four to six weeks before the beginning of the enrichment class term. What information do the Enrichment Class descriptions provide? Besides the title of the class and the name of the instructor, we try to clarify what the (suggested) grade levels for each class will be, the maximum number of participants, the day and time, and a brief description of each course. If the class is NOT on site here at DCS (788 SW Birch St. in Dallas), we provide the exact location of the class to help you make your decisions. In most cases, even if the class is “off-site” in Dallas, you will still be able to get there after or before nearly any other DCS enrichment classes offered here at the school or in other off-site locations here in Dallas (travel time between all Dallas locations is usually no more than 5 minutes by car and usually only about 15 minutes on foot). For classes in Salem or Lebanon, you will have to take travel time into consideration when enrolling in more than one enrichment class per day in different locations. How do I enroll my child(ren) in Enrichment Classes? In order to be fair and to allow as many students as possible to enroll in at least one of their preferred DCS enrichment classes, we ask that families communicate their child(ren)’s TOP THREE Enrichment Classes (in which they would like to enroll) to their Education Guide within the first week after the release of the final schedule (sent to families by email). You should also make sure that any Enrichment Classes your child(ren) would like to attend are listed in their Personal Learning Plan (PLP) and have been approved by the Guide. At the end of that week, we will inform families which one of the top three classes their children have been confirmed / enrolled in. After confirming these registrations, we will open up all remaining available slots for Enrichment Classes to every family through our Online Course Registration System called “Course Storm”. This is a FIRST-COME, FIRST-SERVED system, so be prepared to register as soon as possible after we open course registration! One week after opening online registrations, and at least two full weeks before the beginning of enrichment classes, families will receive a confirmation of the class(es) in which their child(ren) have been enrolled. In how many Enrichment Classes am I allowed to enroll my child(ren)? As many as you can based on availability! You will be charged any materials or registration fee for each class as indicated in the course description. What if my child isn’t in the suggested grade levels for an enrichment class but he or she would like to enroll in it anyway (and I feel that he or she could be a positive and engaged participant, despite the age difference)? “Flexibility” is part of our mission statement! We understand that many children fit outside of standard grade-levels in many ways and we are happy to work with families in order to include children in Enrichment Classes in spite of recommended grade levels. However, the ultimate decision (and the criteria for making such decisions) rests ultimately with the Community Educator (the Enrichment Class instructor). Please let us know early on by phone or email about your wish for your child to be included in a class so that we can contact the instructor before class lists are finalized. We have some classes where children in the middle age groups (usually 3rd & 4th grades) might be able to choose to be in the younger group or the older group, depending on different factors. Can parents attend or help out in Enrichment Classes? Yes! Because we believe very strongly that parents should be able to promote and continue Enrichment learning in the schooling environment, we encourage parent involvement in enrichment classes as “Learner-Helpers”. Parents wishing to attend or help out in Enrichment Classes will be asked to sign our parent Learner-Helper agreement, which basically says you will respect the authority and style of the Enrichment instructor, that you will not disrupt classes (by chatting unnecessarily with students or other adults, for example), that you will help with materials or classroom management as needed, and basically be a positive presence in the class. Then, depending on the number of parents wishing to be involved in each class, you may choose a certain number of classes to attend (from one to twelve, depending on numbers). For example, if we have 15 students enrolled in the YMCA PE class and 10 parents interested in attending classes (and exercising right along with the students, while helping with behavior management from time to time if the instructor should request it), then the instructor might say we can have a maximum of five parents attending each class, so those 10 parents would need to choose alternating classes (perhaps every other week) so that only five parents were in each class. The number of parents and number of days will vary depending on each class. Feel free to call us with any questions about participating in Enrichment Classes. 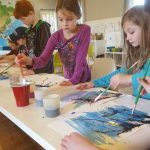 How do parents know what’s going on in Enrichment Classes during the term so that we can make connections with our homeschool learning? We ask our Enrichment instructors to write a short summary of each week’s class(es) on our Enrichment Class Calendar (on the DCS website). You can check the summaries at any time, and you can even see what every single Enrichment educator is doing in every class, which can give you more ideas for your home learning as well! What about Enrichment Classes in other towns outside of Dallas? Although the DCS Charter is through the Dallas Public School System and we are not encouraged to hold classes for our students in locations outside of the Dallas School District, we do try to offer some outside Enrichment Classes in Salem and Lebanon, where we have large enough numbers of students to justify the costs. Outside Enrichment Classes are usually more expensive than those at DCS because of the facility cost on top of the instructor salaries. For this reason, these classes take up a larger percentage of our budget per student than courses offered at DCS. We try to offer enrichment classes convenient to our families while balancing our budget and being fair to all DCS families. We would be unable to offer classes in all the different towns where our families are living. However, we are always open to suggestions and input, so if you have ideas for Enrichment Classes outside of Dallas, let us know! Meanwhile, as you know, you can use your DCS allotment funds to pay for any outside Enrichment Classes approved by your Guide. Why is there sometimes a materials or registration fee for certain classes? Can I use my DCS Allotment money to pay these fees? We have a certain budget for Enrichment Classes for the school year. Many of our instructors would like to provide materials (arts and craft supplies, cooking ingredients, yoga mats, workbooks, etc.) or ask us to pay a higher-than-normal cost per lesson (for special facilities or materials provided). In order to balance our budget and be fair to everyone while still being able to offer high-quality classes and necessary materials we sometimes ask families to pay a relatively small extra fee. And yes, as long as the Enrichment Classes are listed in your child(ren)’s PLP, these fees will be automatically deducted from your DCS allotment money so you don’t even have to pay any bills! UNLESS you tell us otherwise (that you would prefer the fees NOT to come out of your allotment funds and that you would rather pay in another way). What if my child wants to take an Enrichment Class that is not offered by DCS? As long as an Enrichment Class (like guitar, ballet, French, karate, etc.) is listed in your child’s PLP and approved by your Education Guide, you can use your DCS allotment funds to pay for outside Enrichment Classes through other instructors and organizations. If you have certain instructors or providers that you think DCS should try to use as Enrichment instructors, please let us know and we will see if we can come to an agreement with them to offer classes to our students. Why does DCS sometimes discontinue classes that were so popular? As you can imagine, it’s not always easy to find good instructors who are willing and able to come to DCS for only one or two hours per week. Sometimes there is not enough interest and we don’t have the minimum number of students required to continue the class. Sometimes instructors have a conflict of schedule or their life or career situation changes. Sometimes the facility is no longer available. Sometimes a class gets to be too expensive and we can’t fit it into our budget. There can be many reasons. However, we do try hard to continue popular and interesting classes as much as we can and try to take family preferences and feedback into account when continuing, discontinuing, adding and changing Enrichment classes. Near the end of each term, we will send out Enrichment Class Feedback Forms with every student and will use this as a formal feedback process in our decisions for future class offerings and scheduling. How can I get more information about Enrichment Classes if my questions are not answered here?